Our Wabash Mission Dining Chair is made in a Northern Indiana wood shop, like the rest of our LaGrange Collection. It features uniquely contoured sides and a 6-slat back. It is also available as a desk chair -- call today for more information! Other Wabash items include our Amish Wabash Stationary Bar Stool and its mobile version, Amish Wabash Swivel Bar Stool. 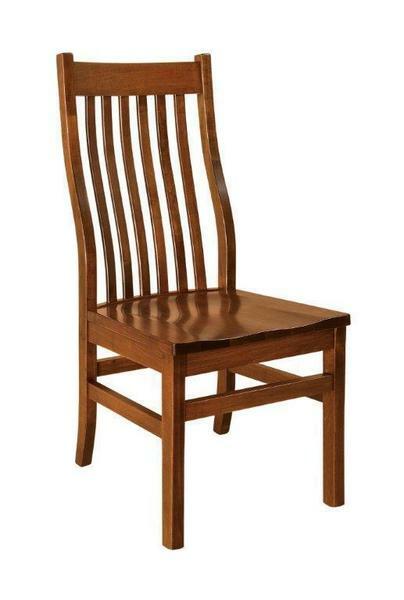 With this chair, order as shown above in brown maple with FC 10531 stain or choose your own unique combination. Whatever you choose, we want you to be happy.